1. 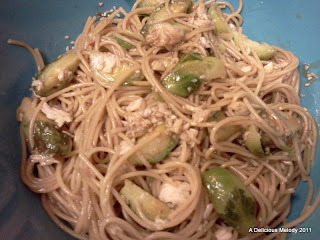 Mix together spaghetti, sesame seeds and cooked meet. 4. Refrigerate for at least 2 hours before serving. Enjoy! Enjoy! You can even make this a day ahead and refrigerate until serving! I love this dressing because it's the perfect mix of sesame goodness (think Wendy's old Asian Chicken Salad) and really good ginger-ness! (think good Japanese Steakhouse's Salads) Yum! Your dish is so unique! I am curious what would it taste like. I better try this recipe using my gluten free pasta.